Andy Bridge lived with his grandmother until his mother reclaimed him, when Andy was kindergarten-aged. He lived with his mother for a couple years, but was taken into foster care around age 6 when she was no longer able to control her mental illnesses. Hope’s Boy is Bridge’s journey into, through, and out of foster care. Hope’s Boy captures an important truth about kids in foster care – and about parents who lose kids to foster care – failures and love are not mutually exclusive. Parents who cannot raise their children still love them, and kids who have been failed, abused or neglected by their parents often still love those parents. Andy Bridge emancipated from foster care, became a lawyer, and now advocates for the rights of children in foster care. 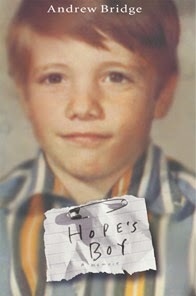 Hope’s Boy is an inspiring, challenging look at one kid’s experience in the Los Angeles County foster care system. Perhaps it’s particularly interesting to me because of the work that I do (foster care adoption) and the place I live (Los Angeles county), but I think the book will interest most of the readers of this site. Recommended for foster parents and prospective foster parents.